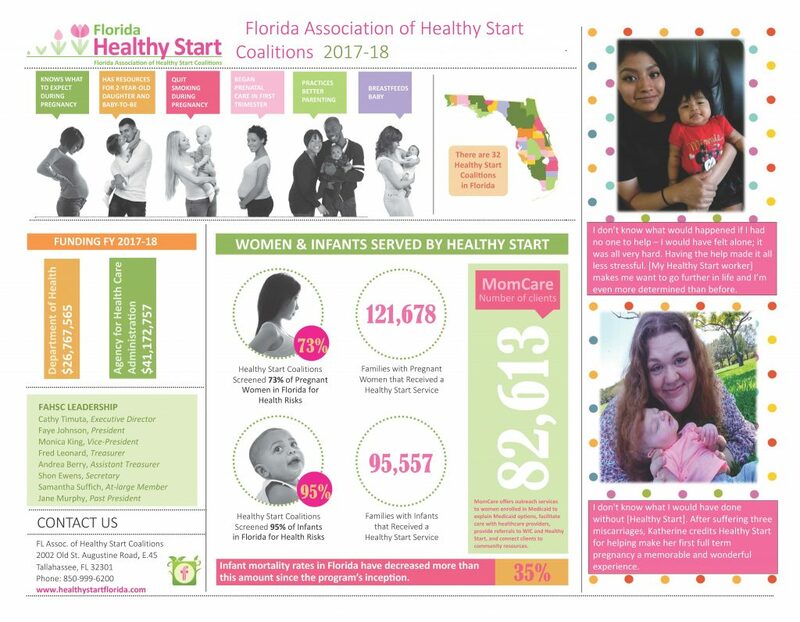 The accomplishments and impact of Florida’s Healthy Start program were highlighted at the annual FAHSC Legislative Reception held recently in Tallahassee. Helena Girouard speaks at reception. Program participant Helena Girouard shared her experience as a young pregnant mother struggling with addiction and credited support from the program for transforming her life and baby’s future. Girouard, who received services through the Healthy Start Coalition of Flagler & Volusia Counties, received a scholarship and completed her college degree. 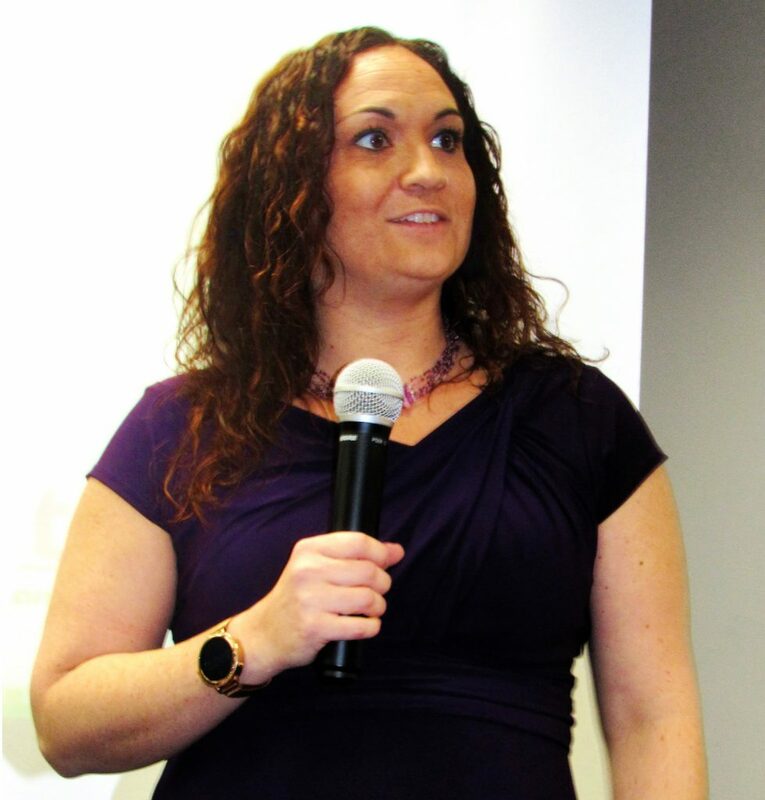 She is currently a Pritzker Fellow for Thrive By Five – Volusia, part of a national effort to improve early childhood systems in local communities. Newly-elected FAHSC President Faye Johnson underscored the importance of Healthy Start and its role in improving the health of women, infants and families in Florida. Cathy Timuta, FAHSC Executive Director, presented program highlights from the annual report spotlighting the State of Florida’s Mothers and Babies. The annual reception was held as part of the FAHSC Quarterly Meeting. Executive Directors and staff from the 32 local Healthy Start Coalitions met to discuss plans for implementing new approaches to delivering services to pregnant women and families of newborns, CQI and professional development, and formulated strategies for addressing emerging issues, including NAS babies. Program updates were also provided by state agency representatives, and other key state partners. 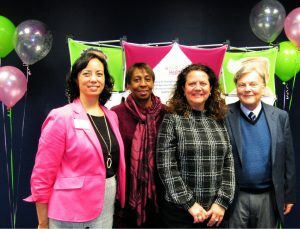 (L to R) FAHSC Executive Director Cathy Timuta, President Faye Johnson, Vice-President Monica Figueroa-King, and Treasurer Fred Leonard. New officers for the association were also elected by the FAHSC membership during the meeting. Congratulations to Faye Johnson, President; Monica Figueroa-King, Vice-President; Fred Leonard, Treasurer; Andrea Berry, Assistant Treasurer; Shon Ewens, Secretary; Samantha Suffich, At-large Member, and Jane Murphy, Past President!